Today is the debut show of the Fantasy Sports Network Radio and you are witnessing the beautiful new home of Fantasy Sports Radio. Tony breaks down his June 23 MLB DFS picks along with the Las Vegas odds. You will also get the latest update in offerings from DraftKings (CFL!). 07:35 DFS legal in NY - What's next ? RotoRadio is the DailyRoto DFS podcast and is hosted by Tony Cincotta. Cincotta, who is a part of the RotoExperts radio team that captured the 2014 FSWA award for top Fantasy Sports Radio Broadcast, will use this platform to tackle industry issues, recap the previous day's action and set you up for success for the current day's DFS slate. 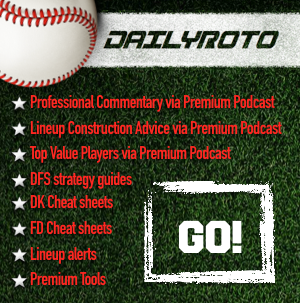 If you're interested in a DailyRoto Premium MLB Package, DailyRoto contributors and MLB DFS players Drew Dinkmeyer (dinkpiece), Mike Leone (leonem) and Chris Pacheco (TheNumbersGuy) bring you in depth position-by-position analysis each day of the MLB season through a premium podcast as well as site specific cheat sheets for both FanDuel and DraftKings. In addition to the premium podcast and cheat sheets, subscribers receive access to lineup alerts up until (and usually after) 15 minutes prior to roster lock. Also enjoy our MLB DFS strategy articles that will put you in a position for success with a firm understanding of topics like bankroll management, interpreting odds, and how to leverage data to your advantage.